A Follow Spot: Got a Fever for Live Performance in February? I know it's hard to get used to the fact that it's 2013, but not only are we in a new year, we're now finished with January and dipping our toes in February. No, I'm not ready for Feb. But I'm trying to pretend I am, anyway! Community Players' production of the operatically inclined farce Lend Me a Tenor finishes up its run this weekend. You have three performances left -- 7:30 pm tonight and tomorrow night or 2:30 pm on Sunday -- with tickets available here. 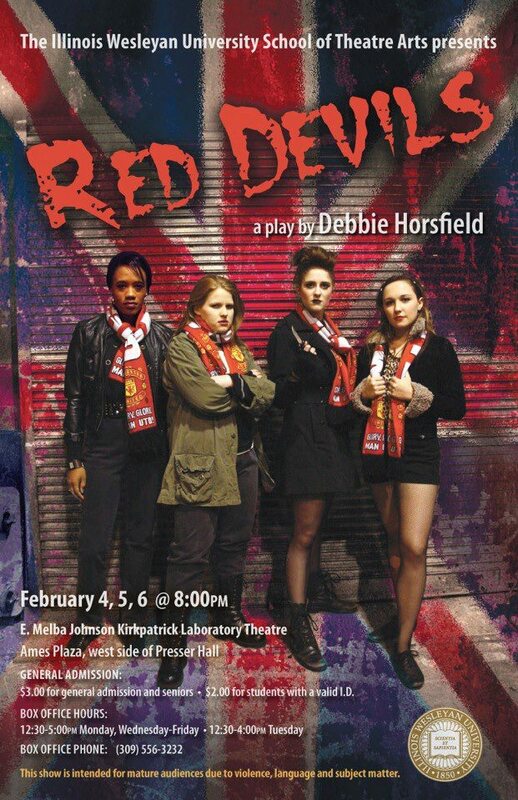 Red Devils, Debbie Horsfield's play about female football fans in Manchester, England, takes the stage inside the Melba J. Kirkpatrick Lab Theatre at IWU on February 4, 5 and 6, with all performances at 8 pm. Visiting Assistant Professor Christopher Connelly directs this gritty take on "working-class characters festering from a life on the dole, a life where soccer is the only activity to stir the imagination." That quote is from an LA Times review of the play from 1993. Eureka College's production of Myth and Bricks, a one-act by Dustin Robert Blakeman, starts February 5, with performances through the 7th. Eureka College senior Jarrod Barth directs and stars in this look at a man, a brick and the relationship between the two. In Bloomington, New Route Theatre opens Katori Hall's The Mountaintop on February 8, with Gregory D. Hicks starring as Martin Luther King, Jr. and Fania Bourn as the hotel maid he meets on the last day of his life, in a production directed by New Route Artistic Director Don Shandrow. 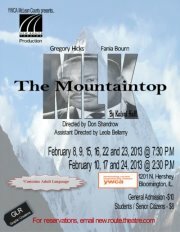 The Mountaintop runs from February 8 to 24 at the theatre tucked inside the YWCA of McLean County. You can reserve tickets by emailing new.route.theatre@gmail.com or you can purchase them at the door on the night of performance. For more information, click here for the Facebook event page for The Mountaintop. Grammy-Award winning a cappella group Sweet Honey in the Rock sings in celebration of the sesquicentennial of the Emancipation Proclamation at the Krannert Center for the Performing Arts in Urbana on February 9. This all-female vocal group shares "the legacy of African American music through jazz, hip hop, the blues, spirituals, rap, reggae, and gospel hymns." For the complete schedule of events devoted to that sesquicentennial celebration at the University of Illinois, click here. Although Donald Margulies' Tony-nominated play Time Stands Still looks at love, marriage and commitment, it really isn't what you'd call romantic. Instead, photojournalist Sarah is wondering whether a safe, secure life with her longtime partner James can possibly mean as much as the time she's spent recording war and strife in the world's hot spots. Love? Career? Safety? Danger? Connection? Detachment? Which of these is the most important? Sandra Zielinski directs Time Stands Still for Heartland Theatre, with Cristen Susong as Sarah and David Krostal as James, in performance beginning February 14. Click here for ticket information and here for performance dates and times. 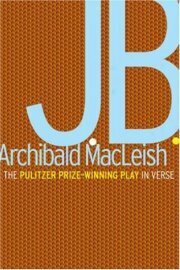 Illinois State University's spring theatre season begins February 21 with J.B., the allegorical verse play by Archibald MacLeish that tells the Biblical story of Job, but set in a circus. Yes, that's right. Job under the Big Top, with a balloon vendor and a popcorn guy standing in for God and the Devil. MFA director Matthew Scott Campbell is at the helm of this ISU production of J.B., with a cast that includes Tommy Malouf in the Job role, Andrew Rogalny, Jr., as the godly balloon man, and Matt Hallahan as the evil popcorn seller. 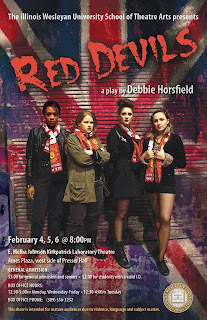 J.B. runs through March 2 in ISU's Westhoff Theatre. Click here for event details. As the battle between good and evil rages inside Westhoff, ISU's Center for the Performing Arts will host Oklahoma!, the Rodgers and Hammerstein cowboys vs. farmers musical with corn as high as an elephant's eye, a surrey with fringe on top, a girl who cain't say no, and all the attendant box lunches, square dances and souvenirs from Kansas City. Will Oklahoma become a state right before your eyes? Is there any doubt? 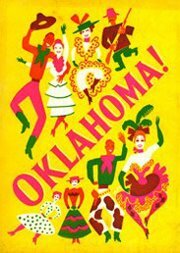 For ISU, Richard Corley directs Christie Duffer and Robbie Holden as Laurey and Curley, the couple who might just be in love, in this Oklahoma! The show opens February 22 and closes March 2. To see a list of performance dates and ticket information, click here. Over in Urbana, the Station Theatre warms up with Stephen Karam's provocative Sons of the Prophet from February 21 to March 9. The play, which explores a hard-luck family who may be descended from Kahlil GIbran, author of The Prophet, was a finalist for the 2011 Pulitzer Prize. Longtime Celebration Company member Gary Ambler will direct Sons of the Prophet in the Station's cozy confines. 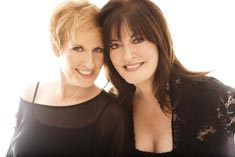 On the 22nd, the University of Illinois' Krannert Center for the Performing Arts hosts sisters Liz and Ann Hampton Callaway and Boom!, their musical revue for Baby Boomers and everyone else who enjoys the song stylings of Carole King, Stevie Wonder, the Beatles and Joni Mitchell. Click here for more information. Illinois Wesleyan is offering a little Shakespeare to brighten your February days, with As You Like It, the romantic comedy set in the Forest of Arden, playing February 26-28 and March 1-3 at McPherson Theatre. Assistant Professor Thomas Quinn directs. 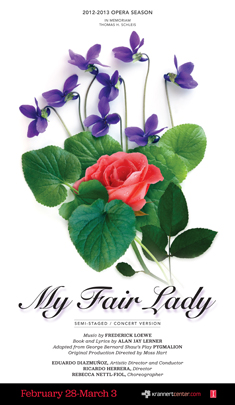 And closing out the month, the Opera Program Series from U of I's School of Music presents a semi-staged concert version of My Fair Lady, featuring all the music and the dialogue from the Lerner and Loewe musical. You can see this concert, featuring the work of Eduardo Diazmunoz, Artistic Director and Conductor (as well as chair of the Opera program at U of I), director Ricardo Herrera, and choreographer Rebecca Nettl-Fiol on February 28 and March 1, 2 and 3. For more information about this My Fair Lady, click here.